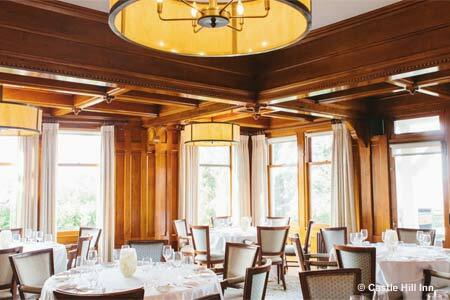 Oceanfront restaurant in the Castle Hill Inn & Resort offers exceptional dining in a striking setting. : Some restaurants brag of making everything from soup to nuts in-house. The signature eatery at the Castle Hill Inn & Resort is happy to draw on local talent from outside its kitchen. Menus credit "friends" including local farms, vineyards and artisanal cheesemakers like Providence's Farmstead. If this open attitude frees executive chef Karsten Hart to focus strictly on cooking, all the better: With three-, four- and six-course prix-fixe menus and a six-course tasting menu available, there's plenty that requires attention. And fortunately, the polite and experienced staff creates a dining experience worthy of the elegant setting. The main dining salon has windows on three sides; come at dusk for striking sunsets. Summer brings small plates and cocktails in Adirondack chairs on the expansive hotel lawn. A meal might start with a delightful amuse-bouche such as sweet potato cheesecake, followed by a bowl of carrot and sweet potato soup. Next, perhaps pan-seared Georges Bank scallops will pack the sting of green garlic, while Muscovy duck carpaccio proves by turns delicate and robust. From an intermezzo of blood orange-honey sherbet, you may move on to tender rack of lamb, lightly crusted with farmer's cheese. Only the chocolate soufflé may be a bit of a letdown, but hardly detracts from the overall enjoyment of an evening spent here (and oh, those views).